Synopsis: An account of the founder of Apple Steve Jobs, focusing on three different points in his life, before the launch of 3 different new products. Review: Chances are good that if you’re reading this, you have some sort of apple product at your home or in your office, be it an iPod, a Mac or an iPad. There’s little question the impact that Apple has had on this market, quite simply, it has revolutionised the industry. But with all the hype that surrounded the launch of these products, there were a few behind the scenes issues that confronted the company’s founder Steve Jobs, and this focuses on the challenges that he faced prior to the launches of these inventions, personal and political. 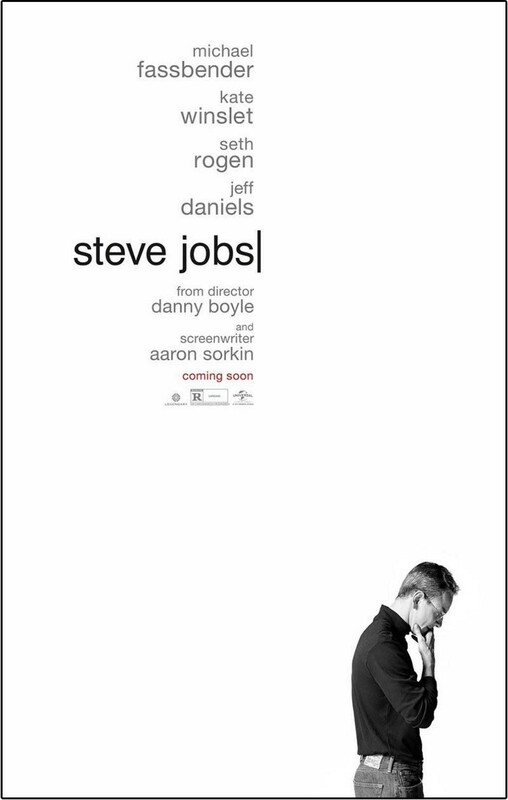 The second film about the creator of Apple, and a film that does do the man some justice. It’s a tale of motivation, what pushes his buttons to bring these revolutionary products to market, and will they work? With screenwriter Aaron Sorkin on board, a writer who managed to make a website about one of the biggest websites the world has ever seen, Facebook, insanely enjoyable and interesting. Similarly with the little details about numbers and maths behind a sport. He does provide once again some very fascinating and riveting dialogue as Steve Jobs battles with assistants and angry ex girlfriends about children that may or may not be his, or if the product launch is encountering a thousand and one problems, whilst also feuding with former employees who are demanding some of the credit for the products that Apple has created. The writing, as usual with Sorkin, is excellent. All of this stuff should sound very boring for many of us, but through brilliant writing, it could easily bore the audience to tears with a load of technical mumbo jumbo that could whizz over our heads, but it does not. That being said, with the film being dialogue driven, some of it does come off as less uninteresting than some other parts. Therefore with mostly great screen-writing, you hopefully can expect some great acting, and everyone in this film is absolutely on point. Most of all is Michael Fassbender as the late Steve Jobs. He has the accent nailed, the look nailed, and he really gets into the role and plays him as tremendously well as someone with Fassbender’s insane talent can, and certainly much better than Ashton Kutcher did. Along with Fassbender, the rest of the cast also bring their A game. Kate Winslet as Jobs’ assistant and good friend Joanna Hoffman, who is supportive of Jobs while also frustrated at his stubbornness. Also venting his anger at Jobs is Steve Wozniak played by Seth Rogan who is unhappy that Jobs is not giving him credit where credit is due for what he believes is his contribution to the company of Apple. The film is divided into three acts, each act set in a different time before Steve is unveiling different products and each act is shot in a different way, the earliest being on 16mm film, with the most recent act being filmed on digital. It was a very smart decision and reflected the way that the technology has changed as time passes through each act. However, despite the dialogue being very interesting, there are some parts that do drag, most notably the controversy between Jobs and a woman who is claiming that a girl is his daughter. It just feels a bit repetitive with her popping up every so often saying that Jobs owes her money for this, and for that, and it just gets a bit irksome. The technology behind these products is what is interesting but there’s just a bit too much focus on the family drama. Nevertheless, the film remains very interesting to watch with some very good performances that could very well get some Oscar nominations for the acting and the writing. Boyle does a tremendous job with the directing as well, he gives everyone a chance to shine, from Jobs, to Wozniak, to Jeff Daniels’s John Sculley. It’s not quite on the level of The Social Network, or Moneyball in terms of a very riveting and very intriguing. Yet it does remain a very interesting and well acted dialogue driven movie, that gives its audience a glimpse into the life of the man who created one of the most successful companies the world has ever seen. Despite some slow moments, the screenplay ensures the dialogue is for the most part very interesting, with assured direction, and the performances are all electric, that could get some awards nods.